Little Bangkok has pleasantly surprised me. I rarely ever feel motivated to pen down my experiences at a chain but after three indulgent visits, this one definitely deserves a mention. I first spotted it in Abu Hail, covered in fairy lights and boasting its NOW OPEN sign in a neighbourhood that primarily specializes in mid- to low-priced Arabic food. My heart sank when I spotted it again in Oud Metha and realized that the restaurant was likely a home-grown chain. 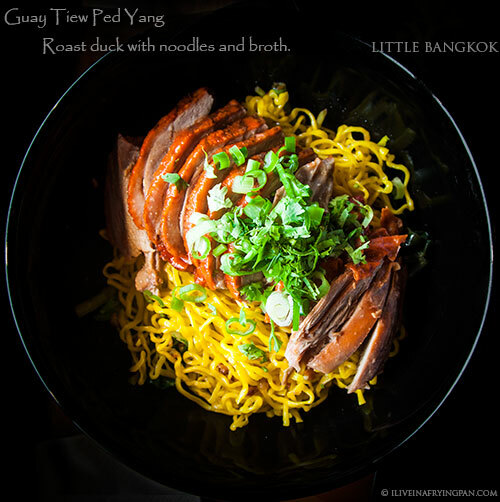 Online research only dissuaded me further – Little Bangkok had also swooped across JLT and Marina, in addition to having one more location that Is still to open on Sheikh Zayed. I’d be happy enough trying it, but this just isn’t the sort of place I usually feature on my blog. 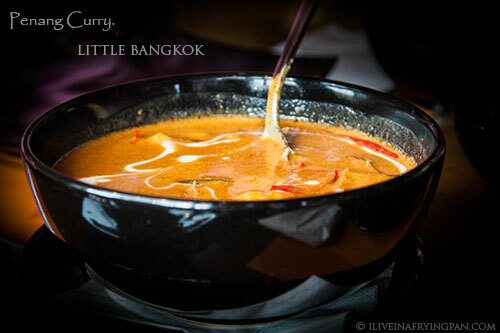 But Little Bangkok has received a lot of positive feedback across its branches, and rightly so. They’ve got an airy, well-lit restaurant set-up with large frames of floating markets and colourful thatch-like lampshades that add to its intended street-style flair. They’ve got an interesting façade with plastic versions of Thai dishes that tease flies and hungry passerby’s with the appeal that only tiger prawns in sticky sauce and noodles in spiced broth can hold. 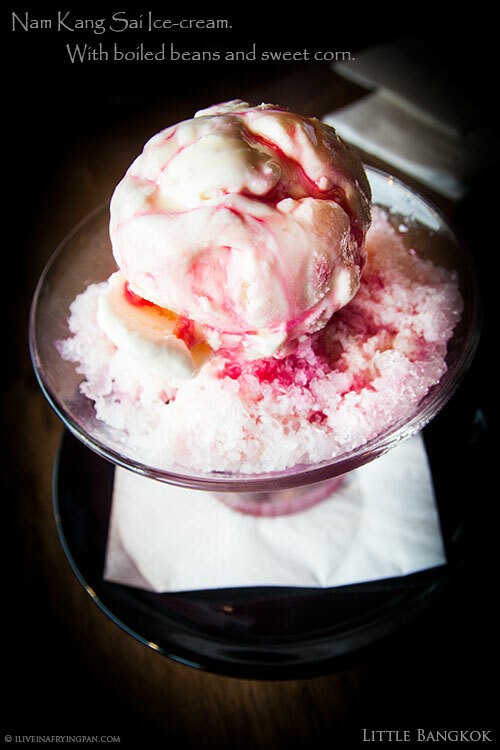 They have a well-categorized menu with appetizing photos that do the trick in a moment of indecision. But most importantly, they’ve got a Penang Curry that’s lusciously creamy and brimming to the core with coconut milk and warming spices. I’ve tried the Penang Curry with tender flattened strips of chicken as well as with plump pink prawns, and the lesson both times was to eat up, go find a bed right after. The last time I had something as memorable was at my favourite Malaysian restaurant in Chinatown, Philadelphia. 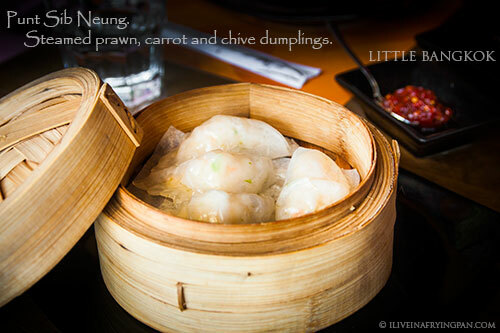 It’s the sort of food that deep, happy slumbers are made of. 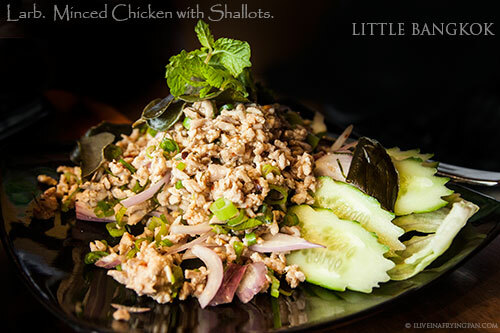 Not everything in Little Bangkok is a hit, but the hits are so flavourful that they more than make up for the blander misses. The jumbo prawns in sweet-sour sauce (Goong Tod Makham), the crispy duck with noodles and broth (Guay Tiew Ped Yang) and the sizzling beef (Kata Ron) were easily forgotten when I left the restaurant, while the chewy sticky glutinous globes stuffed with minced meat (Hum Sui Goh) or the refreshing rice paper spring rolls with an addictive vinegary dipping sauce (which is incidentally green and not red as depicted in the photo on the menu) are definitely memorable enough to be ordered again. The vibrant flavours of lemongrass, kaffir-lime leaves, fish sauce, vinegar and other traditional herbs and sauces shine through unmistakably in most of their dishes, to the point where I had to visit the restaurant three times last week until I could finally – or temporarily – distract myself with other foods. Just to ensure some consistency control, I did go back to the branch I originally spotted in Abu Hail and it turns out that the branch was…not a branch at all. It was a completely different restaurant called Bangkok Town with a personality and ambiance that falls on the other end of the minimalist, street-style feel of Little Bangkok. Bangkok Town is one of those dimly-lit slumbering restaurants replete with cone-shaped purple cloth napkins, aromatic incense and intimate booths. It is a far cry from the overcrowded fish market that Little Bangkok tends to become during peak lunch and weekend hours. While Little Bangkok can often feel quite frenetic, Bangkok Town makes you want to sprawl flat across the table, pick an aroma and succumb to the strong, sleep-inducing hands of an expert masseuse. Bangkok Town is no chain and I’ve only been there once thus far, having already stuffed up on enough curry and noodles over the past week to last me for at least another month of Thai food cravings. My initial feel was that the dishes have potential and are worthy of multiple trials to suss out the best of their cumbersome 189-item picture-less menu. The highlights included fried shrimp with lemongrass, kaffir lime leaves, garlic and crispy caramelized strips of ginger (Koong Tod Tar Khai) and the fragrant coconut milk broth with tofu and vegetables (Tom Kha Je). Neither of these dishes had the same visual appeal of the dishes at chain phenomenon Little Bangkok, but pretty or not, they didn't scrimp on flavour. 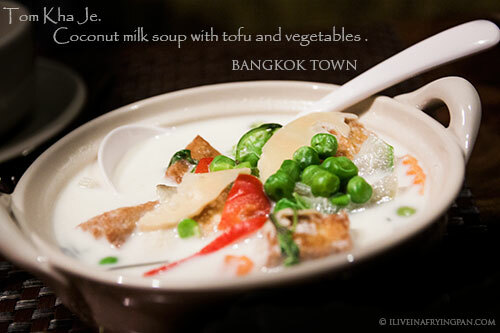 Bangkok Town also scored a few extra points with its complimentary dessert: water chestnuts, fleshy strips of coconut and some other undecipherable fruits and jellies in icy cool coconut milk. 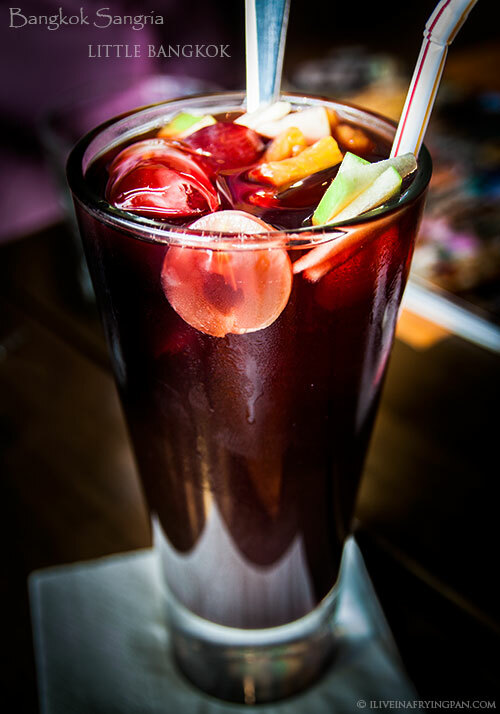 A summer elixir if you will, though we failed to grasp the name of the dessert or dissect its ingredients from our sweetly smiling but barely English-speaking Thai server. 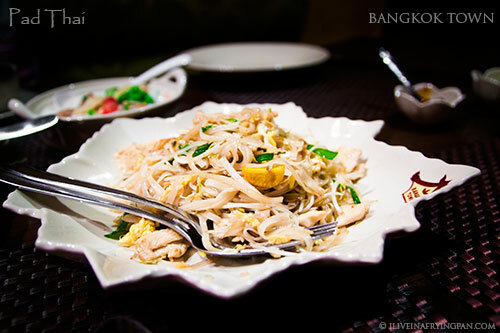 If I had to do a clean comparison between the food at Little Bangkok and Bangkok Town, I’d begin by comparing the Pad Thai at both places. They both have a decent enough version, nothing spectacularly memorable but nothing offensive either. A curry comparison is probably warranted too, as it the Thai green papaya salad and Tom Yum Soup. Tell me what you think if you get to doing all the grub groundwork before I do. The prices are almost the same at both restaurants, one being slightly higher than the other on certain dishes and vice versa so that it all evens out by the end. Little Bangkok might have a slight edge in that their portion sizes are often larger. Service at both is also comparable, except that (a) you can hog more server attention at Bangkok Town in Abu Hail because the restaurant tends to be quite empty, and (b) chainy Little Bangkok’s servers have a better handle on English, though the menus at both restaurants are self-explanatory. 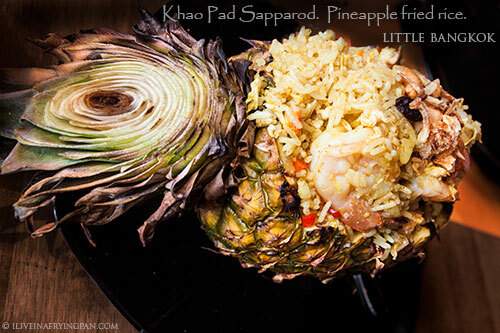 Some of you are probably Lemongrass or Smiling BKK loyalists, or both - but it doesn't hurt to switch up your Thai routine and try a different take. And with most Thai restaurants being located in mall food courts or high-end hotels, I'd say the market for mid-priced Thai is far from saturated. The weeks ahead will help me build the list of hits and misses for Bangkok Town, but in the meantime, here’s my evolving list for Little Bangkok. Don’t let it bog you down, there’s enough variety for you to craft your own feasting exploration at both places. After all, you never know until you Thai. Penang Curry; Pineapple Fried Rice (Khao Pad Sapparod); Little Bangkok Mixed Thai Platter (with lemongrass fish cakes, sundried beef with siracha sauce, marinated meat in crispy gelatinous rice, spring rolls and green papaya salad; Chicken and veggie rice-paper spring rolls (Guay Tiew Lui Saun); steamed prawn, carrot and chive dumplings (Punt Sib Neung); Minced chicken with shallots and mint…this one had a depth of flavour (Larb); non-alcoholic Bangkok Sangria made with cooling hibiscus roselles and whole fresh fruits; both the iced tea with (Cha Nom Yen) and without (Cha Manao) milk, the one without is lighter and more digestive. Pad Thai; minced chicken in a spicy Tomyum broth (Guay Tiew Tomyum); Nam Kang Sai Ice-cream with boiled kidney beans, sweet corn and some sort of cake, all drizzled over with a sweet rosy red syrup. Jumbo prawns in sweet-sour sauce (Goong Tod Makham); Roast duck with noodles and broth – make sure you ask for the noodles to be immersed in the broth should you order this dish (Guay Tiew Ped Yang); Stir-fried vegetables (though maybe the options with morning glory or kangkong might fare better); Sizzling beef (Kata Ron); Saku Cantaloupe dessert (which tasted a bit candle-waxy). Oud Metha, right by the first traffic light after the Al Nasr Roundabout on your way to Lamcy Plaza. Other branches in Marina and JLT. On the same road as the Canadian Specialist Hospital, Abu Hail. They also have a branch in Sharjah. 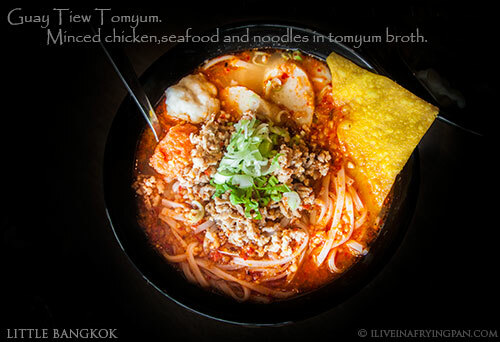 Me and my husband are the biggest Thai food fans and it’s been so difficult for us to find somewhere with good Thai food that isn’t so high end. Definitely going to try Little Bangkok out and can’t wait to hear more about Bangkok Town from you. 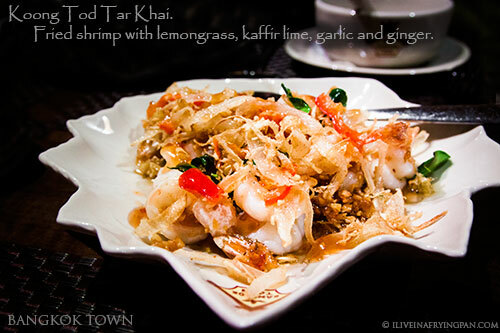 Awesome, glad to add Thai places to your list then Nabeela, let me know what you think of Little Bangkok! Was the Malaysian restaurant in Philly called Penang? That was one of my favorite places ever. Big fan of the blog, Arva. You’ve inspired me and some of my friends into trying our own food explorations of Dubai. Yes it was Penang! God I loved that place…I think I even have a blog post on it from 2010. Their mango tofu and roti canai…it’s the stuff Thai dreams are made of. Thanks for the recommendation Baig, will have to try it! Glad this post can feed a craving Choc Chip Uru – thanks for stopping by! 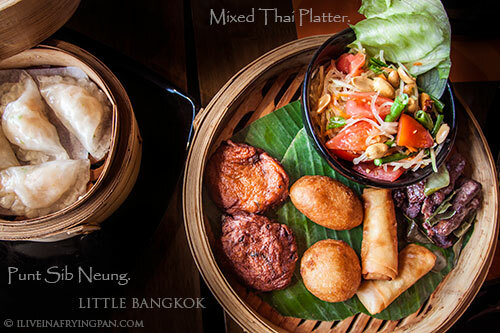 I came to your site to drop you a note regarding Little Bangkok and guess what…this was just reviewed by you :-) We were there at the Oud Mehta branch yesterday and ordered the Dim sum platter, chicken satay and Penang followed by fried ice cream. The Satay is the best we have ever had . All the other dishes were delicious but this was simply outstanding. Great post, as usual. I wanted to ask you about spice level: what you asked for at these two restaurants, and what you experienced. At my current favourite Thai place (Ban Khun Mae, which is uninspiringly located in a MoE food court, but recommended to me by Thai friends), when I ordered there my first time, I asked for the spice to be ‘as in Thailand’. 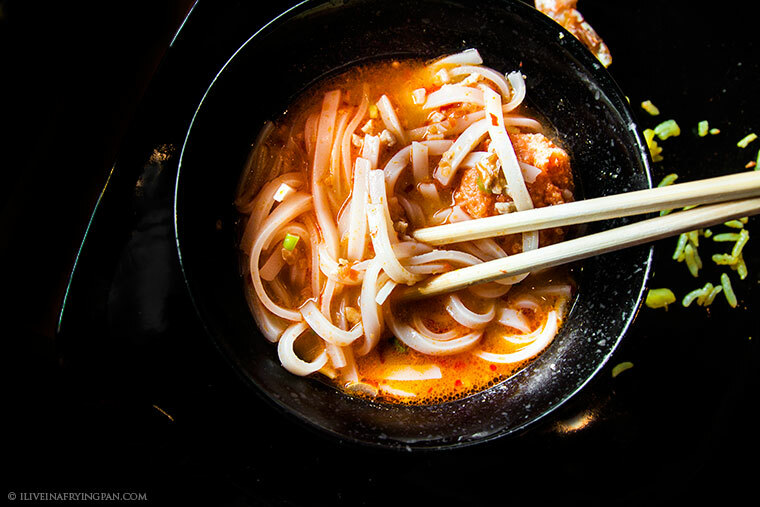 It was so spicy, I could barely eat it (and I have a pretty good spice tolerance). Now I stick with ‘medium’, which is still not for the faint-hearted. Any suggestions for your two new Thai places? I used to eat at a SZR restaurant called The First Malaysian Restaurant, at the top of one of the towers. Sadly, it’s been closed for many years now. Friday brunch at Jumeirah Beach Hotel’s Beachcomber restaurant used to be good for satisfying my cravings, but it has really gone downhill with it’s Malaysian selections recently. Sometimes I visit Indonesian places which serve some of the dishes I love. So, what I’d like to ask, is there somewhere in Dubai that does Malaysian food these days that I haven’t discovered yet? Thanks Marcus! Good question, I usually ask for medium and the dishes at Little Bangkok came out relatively mild. If you like spice, I’d suggest asking for super spicy as I don’t recall any of the dishes – even the ones I’d ordered as spicy for my chilli-loving dad – being particularly lip-singing. Can’t say about the place in Hor Al Anz yet as we didn’t pick any of the spicy dishes, but my recommendation is to go with just ‘spicy’ and play it safe, rather than having your sinuses being blown out to Mars. ;) Not surprisingly, many restaurants in general temper spice levels based on nationality, no matter what you tell them, so take my recommendations on spice levels with a pinch of salt! Oh and join us in November when the weather cools down to feast at Al Fareej. A real dive that place, but oh so worth it.